3. 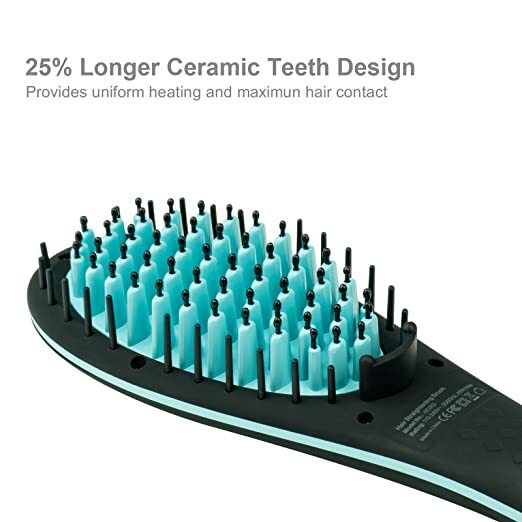 Hair Straightening Brush F.A.Q. Hair Straightening Brushes How Do They Work? Is straight smooth straight hair what you are looking for, but tired of ruining your hair from a flat iron. Is your hair type dry and course? Maybe the Electric Straightening Brush is the right tool for you. They are powered by electricity that connect to a heat generated plate that forms the base of the brush. The plate can be made of material such as tourmaline or ceramic and when heated can reach temperature of 400+degrees F. These materials are super smooth and allow the hair to glide over their surface without tangling. The hair is then drawn across the plate in a brushing motion to straighten the hair and will also release negative ions that gives the hair a silky, smooth look. To get a bit more technical, the keratin in the hair has atoms that create molecular bonds that make hair curly, wavy, or straight. The heat breaks these bonds allowing the hair to be reshaped so if it’s to curly or wavy, it will be straightened after the heat application. Simple, Huh? Check out this video hair showing you how to use a hair straightening brush. Electric Hair Straightening Brush, Can they Be Used On All Hair Types? The hot straightening brush can be used on all hair types, from average to thin or damaged hair and you can use it daily. They do not get as hot as flat iorns so there is less chance of damaging your hair. They may take a bit more time at first, but they do add a shine to your hair as well. Another great feature of the hot brushes is that they do add volume to the hair. Some styles of hair straightening brushes do have a hard time getting close to the roots of your hair, so if you have extremely curly hair you may still find the need to use a flat iron close to your roots. This obviously depends on what style you are trying to achieve. How Long Does It Take Using A Straightening Brush ? The first thing that you will want to do before using an electric hair brush is to shampoo your hair with a good quality shampoo and condition it. Most electric hair straightening brushes will tell you to apply a heat protectant spray, even if they don't do. Applying a heat protectant is a must. A heat protectant spray will run in price on average $6.00-$20.00 and you can find them at WalMart, Target, Sephora, Amazon.com and local drug stores. Massage the heat protectant evenly throughout your hair spending time to get it to the tips of your hair also. I like to use a small amount of Argon oil as a follow up to the heat protectant. Since my hair is color treated, every little bit of extra care pays off in the long run. Next, section your hair off as follows, two side sections, two back sections and two top sections. This works best for me and allows a clear view of my progress as I work the brush through my hair. Take a small part of a side section and use the electric hair straightening brush like you would a normal brush, just slower. You may have to brush through each section a couple of time to get the desired straightness. Since you took the time to prep your hair well, additional brushing is not going to damage your hair. Follow this procedure on the entire head and MAGIC will happen. You won’t believe just how easy it is from beginning to end. If you wake up the next morning and you have a few wild ones, you can simply to take a quick zip through your hair and you are ready for the day. Yes! It is just that simple. Finally ladies, someone has invented a hair tool that will save us time. After reviewing a ton of these brushes, I have listed some of the best hair straightening brushes for your consideration. You will have a great time with one of these straighteners and I can almost guarantee your happiness with the results! The MiroPure Brush Electric Hair Straightening Brush will give you even heat distribution with the ceramic plates and lessen the time you need to spend on the entire process. It has anti-static technology that will diminish frizz and flyaway hairs. It will heat up in 60 seconds to temperatures in excess of 400 degrees. If you forget to shut it off, it will turn off automatically after 60 minutes. It will leave your hair smooth, silky and straight! This electric hair straightening brush The DAFNI Ceramic Brush is 8 times faster than using a flat iron and gives you that salon look in a very short period of time. The heat on this brush stays at a constant 365 degrees so you don’t need to guess where to set it. Just plug it in, let the ceramic plate heat up and you are ready to go. This product will work on dry, oily, curly, fine, color treated and coarse hair and you can use it every day without damaging the hair. Due to the large heating surface area, you can do the entire head of hair in a short period of time. The MILUSh 3D Straightening Brush boasts of its constant heat temperature that assures maximum hair protection and will avoid any burns due to its unique shielding design. It has springy plastic coated insulators on the bristles that prevent the hot surface from reaching the scalp. No need to section off your hair, just let the brush heat up and start brushing your hair as usual but in a slower fashion allowing the heat to penetrate each strand of hair. You will spend minutes instead of hours to get the look you desire. When you use the Apalus Straightening Brush as directed you will never have creases that a flat iron usually leaves. It will work on all types of hair no matter how thick it is. Don’t be afraid to tackle a long, coarse head of hair because the Apalus can handle it with no problems. You may want to section the hair off if it is really thick so you can check your progress as you go. The handle and the head of the brush to not get hot so you are protected from any possible burns. This product has all the necessary safety measures built in. The Instyler Glossie Ceramic Styling Brush will straighten your hair and also allow you to do some styling techniques around the face. The style of the brush allows you to apply tension to achieve that straight look while giving a polished smooth finished look to your hair. The cool tip ionic bristles are surrounded by the tourmaline ceramic plates that allow you to eliminate the frizzy look and end up with that smooth straight look in one pass. The brush style gives you the ability to get closer to the roots than many other brush styles. You can use this brush on all types of hair and is safe to use it daily. 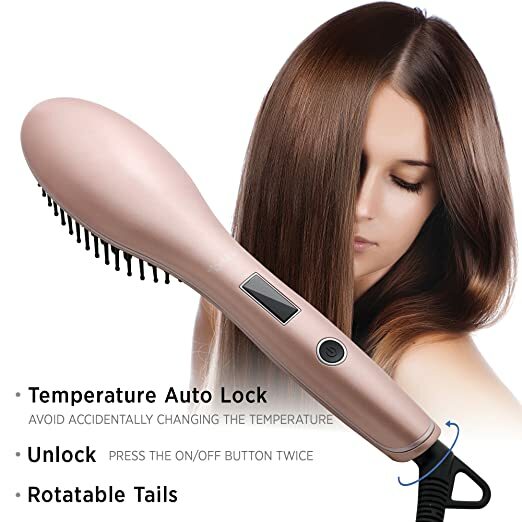 This electric hair straightening brush, the AsaVea Brush comes with an auto lock feature that prevents you from accidentally changing the temperature. Having a constant is necessary for a successful procedure. The cord rotates a full 360 degrees so you never get in a tangled mess. The metal ceramic heater produces constant heat and is ready to use within a minute of turning it on. Using a normal brushing motion, but slower, you will achieve fantastic result in half the time it would take to use a flat iron. If you get distracted and forget to turn the brush off, it will automatically shut down within 30 minutes. It will leave you a beautiful head of smooth and silky straight hair. As far back as 1872, ladies were straightening their hair with a process that would take up to and over two hours and was done with a metal looking rod that was heated on a stove. These rods were invented by a lovely Parians gentleman by the name of Marcel Grateau. After the straightening process, the hair then had to be styled. Simon Monroe was the first person to register a patent for the hair iron. It consisted of metal teeth, much like our modern day combs and it would be heated and pulled through the hair to straighten it. Another patent by K. Shero was offered in 1909 and it was two flat irons that were heated and pressed together with the hair in between the irons. Finally in 1912, Lady Jennifer Bell Schofield created the product that most resembles our modern day flat irons that consist of two plates that are hinged together in the middle. They are heated and the hair is drawn between the two plates to remove the curl or wave. For years ladies used the above methods until the 1980’s when beauty companies started to put plastic handles on the hot plates so they could market them to the public. From then on, the products to straighten hair have progressed to the heated brushes that are used today. As we look at our modern day beauty tools, we will concentrate on the straightening brush and its benefits to you the customer. The are shaped just like any other hair brush, with bristles and a handle. Don’t confuse the Straightening Brush with the Hot Air Brush, they are two different tools. Hot Air Brushes work with, hot air and rotating barrels while the Straightening Brush is much less complicated and easier to use. NOTE: These brushes are less damaging to you hair then traditional flat irons. So lets get started at looking at which ones are the best to buy. After looking at several of the best hair straightening brushes, the constant fact among them is that they can save you a ton of time. Couple that with the fact that damage to the hair is almost non-existent. Success rates are off the charts which should tell you that this is the next best thing on the hair care market. It can be used on all types of hair and can be used daily. Be sure to use the pretreatment sprays and I don’t see any reason why you would not want to give the hot brush a try. You can master the application right out of the gate because it is just like brushing your hair and you’ve been doing that for years. If you would like to learn more about repairing your damaged hair and getting it back to a healthy state, read my article on this site here. I hope that I have helped you understand more about hair straightening brushes and given you insight in the some of the best hair straightening brushes. Wishing you much success with your new purchase, and hoping you love your straight hair! Feel free to leave a comment on what you think the best hair straightener is or any other questions you might have here. Single dad trying to learn, and this was exactly what I was looking for to help my daughter straighten her hair. Thank you for this excellent review. I am glad this was helpful to you. Please don’t hesitate to reach out and let me know if you have any other quesitons or concerns and I would be happy to help. I use and personally love the DAFNI Ceramic Hair Straightening Brush! Great! This helps me in finding a gift for my wife. Hi Jason. I am sure you wife will not be dissappointed in this alternative to straightening hair. Hi Shelly. It is a great alternative to the flat iron which can be very damaging to your hair. You may find you still like the results of the flat iorn better and if you do this is still a great tool to alternate with the flat iron, so that you are preserving the health of your hair when ever possible. I use the Hair straightening brush for everyday use but when I have a special occasion I will use the flat iron as it does give it a more polished look. Electric hair straightening brush gives amazing results. This is very informative and well described. It’s easy to understand all the points being made about this electric hair straightening brush. I enjoyed it a lot and will share what I learned with all my friends. This is exactly what I was looking for. Needed an electric hair straightening brush and wanted the best. Thanks! There are so many good electric hair straightening brushes that it’s hard to pick one. There are so many, I agree. I hope this review helped you narrow it down to the top rated ones. Thanks for all the great info. I was able to decide on which straightening brush is right for me. Thank you. Thanks for sharing this informations about electric hair straightening brush. With Christmas around the corner I think this would be a good present for my mom and sister! The first time I purchased a hair straightening brush after the first time using it I thought “Nope, never doing this again.” It didn’t work nearly as good as a flat iron and didn’t feel like it was any less harsh on my hair. Later I learned that I was just using a cheap electric hair straightening brush, I bought a new one and I love it! Make sure you choose the right one. I am really interested in trying one of these electric hair straightening brushes as I feel like my flat iron is frying my hair. This is a great guide! Even for men, haha. Now I know which electric hair straightening brush I can get for my girlfriend. Thanks!